The Arrow at a mere 16 x 32 cm hangs unobtrusively in a monastery foyer. At first glance it appears to be a simple, swiftly drawn sketch, but its simplicity soon reveals an intentional, intrinsic dynamic of control of line and subtle brushwork. It is done in black inks on white architectural design paper. Further, The Arrow seems to be framed in such a way as to complement its meaning. The figure has stretched himself out to the ultimate measure. His feet are arched as far as possible without toppling the torso. The tips of the fingers are almost to the edge of the frame as if his desire reaches above and beyond his own limits of space. At the same time, like every finely shafted arrow, there are varying places of flexibility in its slender spine that gives the impulse to the spin, which we see in the dynamism of the spiraling lines of the wrists. It is this spin that gives the last impetus toward its target. We do not know who the author of the above was. Personally I would venture to say that he or she must have been a well intentioned observer of the spiritual leader, as the description and illustration have a kind of gentle, curious keyhole sense about them. The author/illustrator has surely given us a description clear enough to inspire imitation even up to the present day. From a quick survey of the other eight kinds of prayer one suspects that St. Dominic definitely appreciated the fact that one’s physical stance or disposition can be conducive to prayer and that each position disposes one to different ways and intentions of prayer. It is also said that St. Dominic encouraged his brothers to pray this same way as well. He was often heard repeating encouraging lines from the psalms or prophets like “Hear, O Lord, the voice of my supplication, when I lift up my hands” (Psalm 27:2) and “Let my prayer be directed to thee like incense” (Psalm 140:1). Of course the illustration is only reflecting what the observer saw. With this in mind let us return to our image of The Arrow and once again trace with our eyes the figure from toes to fingertips. 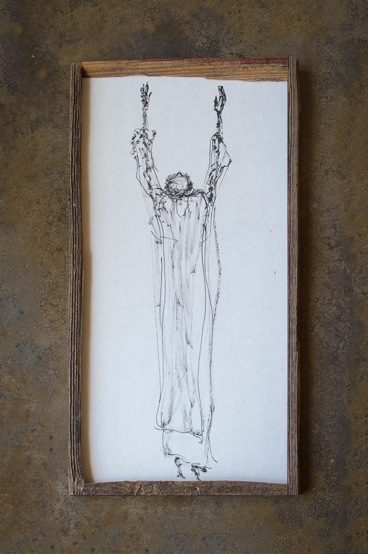 Clearly the drawing is not just an external observation from a distance of St. Dominic praying. Rather, from the feel of The Arrow’s compelling intensity the work has somewhat startlingly drawn us inside and united us with the taut figure stretching to the highest heaven in prayer. 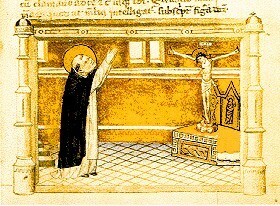 In short, the illustration from the 13th-century anonymous artist shows us an exterior mode of prayer that we might be able to copy physically, while our 21st-century artist S. Claire Rolf OP seems to have opened her heart and left the sound of its striking intensity echo into those of our own. S. Claire Rolf OP: The Arrow, 2008, 40 x 80 cm, black inks on white architectural design paper. Queen of Peace Monastery,GaribaldiHighlands, Squamish, B.C., Canada. Sister Claire Rolf OP is the prioress of Queen of Peace Monastery in SquamishBC, Canada. She was formerly the prioress of the monastery the Holy Preaching of Prouilhe in France, which St. Dominic founded in 1206. In 2007 she returned to her homeland to help in the foundation of Queen of Peace Monastery in the Archdiocese of Vancouver. Formed to be a Dominican contemplative, she has no formal art training. Nevertheless simple pencil sketches, ink drawings and water colour paintings are scattered through her prayer journals. Contemplation, which is seeing and pondering with love, attempts to perceive and receive mystery. Pushed into a zone beyond words artistic expression became a finite response flowing from the infinite, from desire. Influenced by Canadian Impressionists as well as Romanesque sculpture and the more modern art of Matisse and Arcabas, she has done sculpture in clay and wood, acrylic painting and ink drawings which are in monasteries and private collections in Europe and in Canada. For more about the monastery, see www.dominicannunsbc.ca/Queen_of_Peace/Queen_of_Peace__.html. Dr. Matthia Langone is a conference speaker and iconographer. An unexpected encounter with some of the most beautiful and renowned Russian icons in the Kremlin cathedrals in Moscow compelled Matthia Langone to embark on a quest to understand the icon. She pursued studies at the Prosopon School of Iconology, the Vancouver Academy of Art and at the AngelArtAcademy in Florence. She also studied under the Russian master iconographer Vladislav Andrejev. Inspired by his teaching, Matthia assimilated his ‘liturgical method’ into her own Master’s research and concentration in Russian Byzantine iconography, which she completed at RegentCollege, an international graduateschool of Christian studies in Vancouver, B.C., Canada. Matthia’s own work has been exhibited in Canada, shown in Rome and Portugaland kept in private collections. She has designed college courses in Iconography and continues to lecture and give workshops on the topic. She lives in Vancouver, B.C., Canada. See www.wayoftheicon.com.